Rent Courtyard Marriott San Diego | Corporate Events | Wedding Locations, Event Spaces and Party Venues. Find a winning mixture of laid-back California style and cutting-edge design at the Courtyard San Diego Mission Valley/Hotel Circle. Located in the Mission Valley neighborhood of San Diego, our hotel offers travelers access to all points of interest in the city. Our event professionals at the Courtyard Mission Valley/Hotel Circle are passionate about creating the perfect event for you. They have planned thousands of events and would be honored to be a part of your celebration. From the creative catering expertise to the floral creations suggested by your personal catering manager, the team works with you to create the perfect setting. All rooms are accessorized with 32-inch plasma TVs and luxurious bedding. Our on-site amenities include a 24-hour sundry market, a fitness center, and an outdoor pool and a whirlpool. Be sure to dine with us at The Bistro, our signature American restaurant, or enjoy a drink at The Bistro Lounge. -Take advantage of our eleven venue spaces, the largest of which can accommodate 300 guests. -Our state-of-the-art meeting facilities include full audiovisual services and specialty lighting. 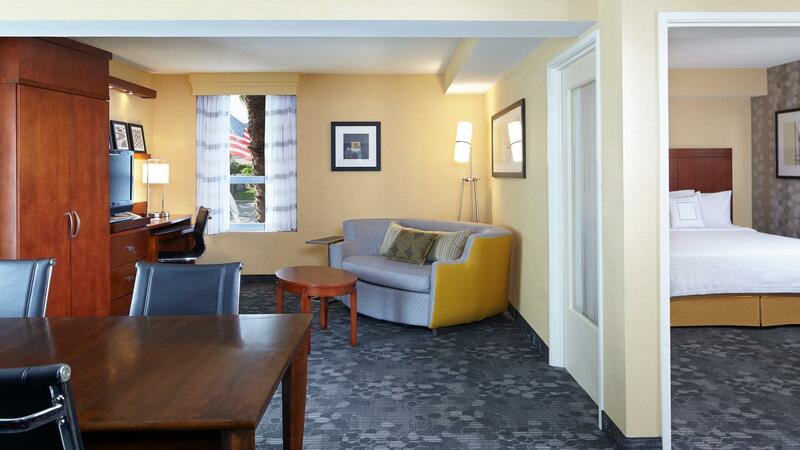 -Stay connected in San Diego with free high-speed Wi-Fi Internet, available throughout our hotel. -Handle last-minute meeting tasks like copying, faxing, and printing at our on-site business center. Host your wedding in our 6,800 square feet of reception space. -Allow our certified wedding planners to assist you in coordinating every detail of your special day. -Collaborate with our seasoned catering professionals to create a personalized menu.